The OnePlus 2 smartphone will be available on open sale on Amazon India from tomorrow onwards. The company just announced that its flagship smartphone will be put on open sale from 12AM on November 25 and the sale will continue till 11.59PM on November 27. According to a blog post made by OnePlus, the sale is part of the promise made by the company, to make up for its failure to meet demand with the OnePlus 2 this year. OnePlus has been ramping up its efforts in India in order to drive sales. When the company entered the country last year, its then flagship smartphone, the OnePlus One, took the market by storm, halting Chinese manufacturer Xiaomi’s rapid expansion. That said, the OnePlus 2 faces much more competition than its predecessor. Phones like the Honor 7, Moto X Play and others have given it touch competition, while higher priced phones, like the new Nexus devices, have also gained a lot of interest from consumers. Meanwhile, while the OnePlus 2 may have faced supply issues, OnePlus has introduced a second smartphone this year. The OnePlus X, which was launched in India recently, is a lower priced smartphone that focuses on design. Despite the sleek and premium design though, there have been many who have questioned the OnePlus X’s value, citing reasons like 16GB internal storage and the Snapdragon 801. Even so, both the OnePlus 2 and OnePlus X remain amongst the favourites in the market, with many users still looking for invites. 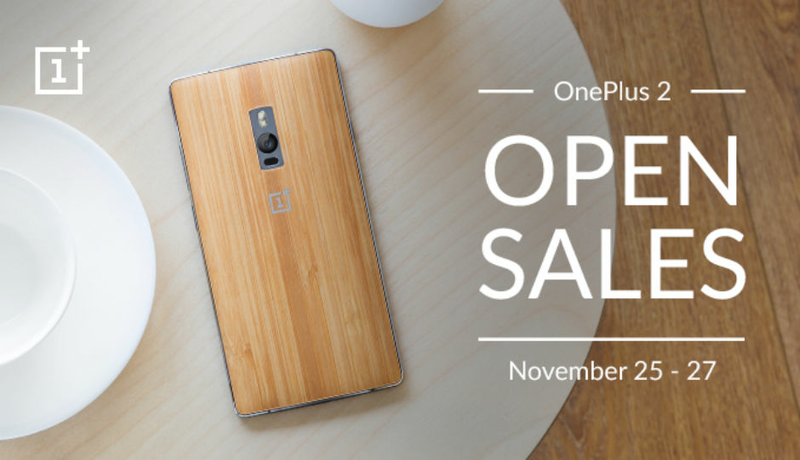 The open sale though would allow you to buy a OnePlus 2 without the aforementioned invites. For the uninitiated, the OnePlus 2 has a 5.5 inch 1080p display, along with 4GB of RAM and the Snapdragon 810 SoC. In addition, the phone has a 13MP camera on the back and a 3300 mAh battery. It comes with OnePlus’ custom Oxygen OS and has a fingerprint scanner.